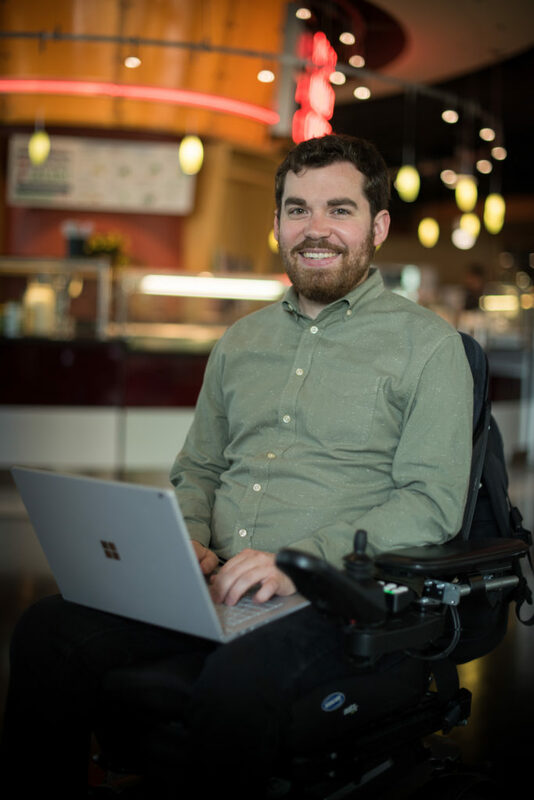 With nearly ten years of experience under his belt, senior software engineer at Microsoft Chris Schlechty, who lives with limb-girdle muscular dystrophy (LGMD) has become an expert in his field. Within that same time period, he has also become an expert in knowing what accommodations he needs to be successful in the workplace. “It’s been easy to ask for accommodations at Microsoft. When I shared my list of accommodations, my main focus was getting a work station that suited me as well as making sure the tables I used were the right height. Microsoft also had an occupational therapist do an ergonomics evaluation to make sure that everything was correct for me. I also have flexible work hours and the ability to work from home,” says Chris. Chris has always loved math, science and computer games and knew from a young age that he wanted to work in the tech industry. In high school Chris joined the DO – IT Scholars program, which helps students with disabilities learn about self-advocacy in the work place and encourages them to pursue internships and careers in STEM. From encouragement through this program, Chris applied for an internship with Microsoft and landed gigs with Microsoft twice: once after his senior year of high school and another one later in his college career. After earning his degree in computer science from the University of Washington, Chris began working full time at Microsoft and has been there ever since. Now, fully immersed in his career, Chris encourages students who live with disabilities to pursue higher education and challenging careers. “If you’re really passionate about something there is probably a way to make what you want to do work,” shares Chris. 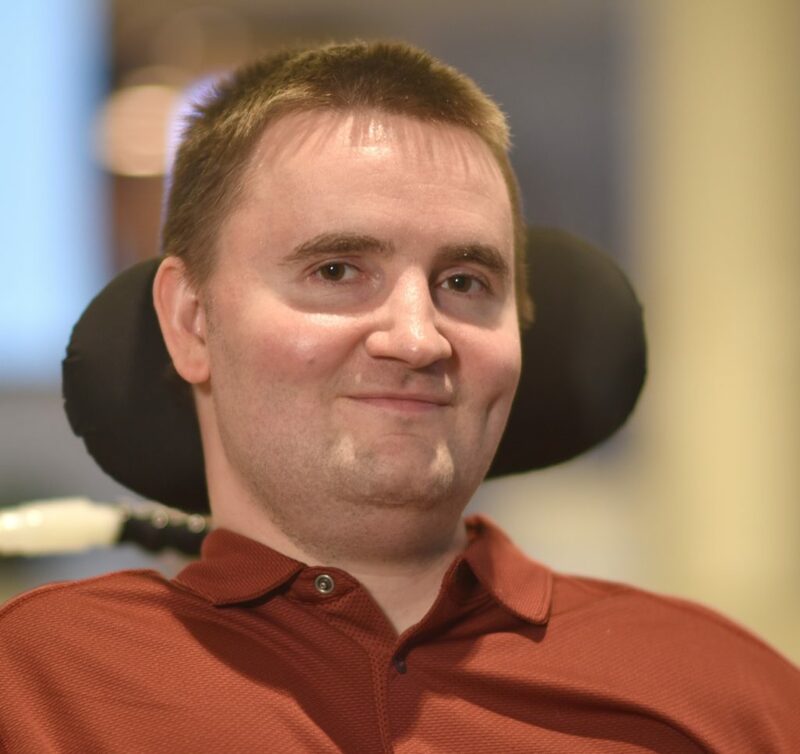 A bit newer to the team at Microsoft is Sean Marihugh, who lives with Becker muscular dystrophy (BMD) and works on the product accessibility team. In his role Sean, provides tech support to customers who live with disabilities. “It’s a great way to interface with customers. I’m able to get feedback on what is and what isn’t working and share that information with our product engineering teams,” shares Sean. Sean learned about career opportunities at Microsoft while in school at the University of Washington, meeting people who worked both in and out of the accessibility field. Though he began his career at a different organization he kept in touch with one of his contacts from Microsoft, who would eventually tell Sean to apply for his current role. Sean has now been with Microsoft two and a half years. While Sean has not requested any workplace accommodations, he believes that it’s important to request accommodations if you do need them. “It will make you more successful in your career to ask for what you need to succeed. Knowing and owning what tools, attitudes and networks you’ll need will help a lot. And if you do need accommodations remember that assistive technology that can really go a long way,” says Sean.